We are having a record breaking snowfall here in N. Texas, my friend from N.Y. state that lives near Copperstown doesn't even have this much snow right now, all the big snow falls up there have just missed them. By the grace of God we have power and are praying for all the folks who don't. My love bugs card is kind of like that old saying, "you can put one to many sequins on something". When I got through putting the card together I thought it needed something and thought, "oh, sugar dust would be just the thing", but now I'm not to sure. When you're not the do over girl, you take what you get and learn from your mistakes, unfortunately you guys have to put up with viewing some of my mistakes. 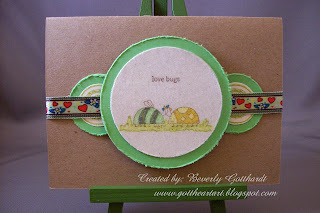 Design Dollies have 3 challenges per week and as it turns out this card is for 2 of their challenges this week. Supplies: Kraft card blank 4" X 5 1/2" Paper Reflections, Paper: Stampin Up-Green Galore, Very Vanilla, Stamps: Stampin Up-Love Bug, Will 'n Way-Whimsy Borders, Ink: Ranger Archival Ink-Coffee, Stampin Up-Kiwi Kiss, Copic Spica Clear glitter pen, CTMH markers-honey, sunny yellow, garden green, sunflower, ocean, key lime, Stamp La Jolle-Sugar Dust, Stampin Up-1" circle punch, Fiskars Shape Cutting template-Circles-1, Double-sided sticky sheet, Mary Engelbreit ribbon, pop dots. Love it! Way to get more bang for your buck with two Dollies Challenges! Love the combo! Thanks for playin with us Dollies!